I think because Holly and Venom could be SOOO TROPEY. She is wounded and vulnerable and hurting after suffering terrible abuse and *gasp* he may even have to kill her if she turns out to be dangerous *angstangstangst woe! * and he is so much older and more powerful than her. And she doesn’t have clearance but wants to be involved and he is protective and sheltering and there would be Spunky Agency as she does, just, ALL the stupid things and he will lock her up for their own protection and every scene will be full of them hating each other while spending entire paragraphs commenting on each other’s arms/muscles/breasts/eyebrows/belly buttons. And none of this happens! Yes, Holly has had a deeply traumatic past, yes it still haunts her and yes she has flashbacks and nightmares. But that doesn’t mean anyone - not Dimitri, not Venom, no-one - is putting her in a little box to keep her safe nor does it render her incapable of being a valued member of the team. Yes Venom is much older and more powerful than Holly, but he easily recognises the unique power and abilities she has, respects her as a force to be reckoned with, helps work with her to develop those powers (though, even better, Dimitri is the one who assumes the role of mentor and their ENTIRELY NON ROMANTIC RELATIONSHIP is paternal) without in any way regarding her as anything but an equal. Young, but an equal - and age is something she can acquire. And yes, her unexpected powers means she may be unpredictable and dangerous which both are wary about - but also mature and sensible and recognise why it this is the case and don’t dwell on it. And while Venom comes to love her not once, not one time, does he decide to put her in a small box and protect her. He will recognise when his skills are more appropriate but he is happy to work with her on operations and doesn’t spend time angsting that ZOMG SHE IS IN DANGER. And he even recognises there are times when she even has skills and contacts and abilities that he doesn’t have. And while they do both acknowledge the attractiveness of the other they spend far far far far more time on banter and sarcastic insults than ever they do on drooling. And it’s so much fun. We also have some nice moments looking at vampires - and angels - who aren’t super awesome and beautiful and powerful and amazing which is a nice twist considering the super powered awesomeness we’ve seen in the last nine books. It also looks at angel society in a more in depth way, reminding us there is a vampiric underclass: we get to see both the very understandable judgement of those with immense power and potential doing absolutely nothing with all their advantages and life - but also seeing the really brutal cruelty that grinds up and destroys good people who certainly deserve a lot better. Venom’s attitude contrasts very nicely with Holly to both give her experiences outside his but also to show how much the cruelty of society is less “some people abuse the system” and more an accepted part of the system itself. From that I also really love that the moment when Holly starts to melt to Venom seem less after especially witty banter, or his extreme hotness or him saving her - but when he shows kindness to people who are weak, vulnerable and, by their society, completely beneath him. This is, perhaps more than most of the rest of the series, a very personal stories. We do have some Archangel elements going on which are somewhat linked to Holly’s unique ability (which also has a nice element of humanising the Archangels while also reminding us they’re alien godlike beings. 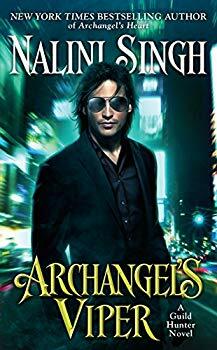 It would be so much easier to have the Archangels who are just evil or monstrous or unknown - but making them both human and ethereally alien is really excellently done). The focus is instead more on Holly and Venom’s personal story. I think this works quite well in the greater concept of the series because we’ve had so many massively epic stories before this - toning back the epic for a book or two isn’t so bad when we have so much epic elsewhere. But if we are going to focus on two characters, their relationship and their development then those have to be really well done - and these were. They also bring considerable racial diversity to go with the awesome female character Holly and her subverting every sexist romance trope ever. Holly is Chinese-American descent and is very clear on this describing herself and her family - this isn’t a passing reference or a stereotyped caricature but is a part of what makes Holly, Holly. Venom is from India and as we explore his background - and real name - this is clear in both his history and his food culture which becomes a major part of his bonding with Holly which I like a lot.